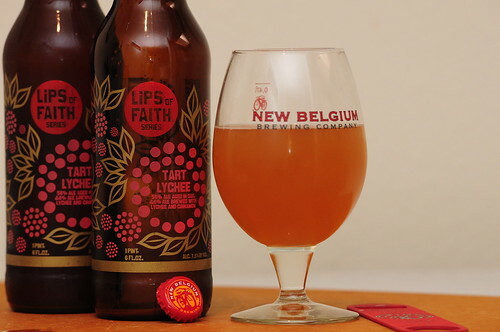 New Belgium Lips of Faith Tart Lychee, originally uploaded by adambarhan. S: Quite tart with some noticeable fruit character, Some good green apple and lemon notes, along with a mild barnyard funkeness. Not sure what a Lychee is or smell like so cant compare it to that. T: Lots of great lactic tartness and fruit flavors. Definitely some green apples, and lemons. The oak is there, mainly in a tannic and mildly funky form. Decent amount of brett funk and dryness. M: A puckering tartness along with a dry finish, medium body, and moderate carbonation. D:Great beer, nice balance, and complexity with a touch of sourness. I would buy this again for sure.